Anthony Watts is going great guns into deniersville. He's now up to 11 protests about the US National Climate Assessment. In his latest WUWT protest (archived here), Anthony called the news about the report a "flash in the pan". He showed, via a Google chart, that the report generated a lot of media interest for about four days around the time of its release after which, unsurprisingly, it tapered off in the news. Anthony seemed to think that meant it climate news isn't important in the USA. I think it's a feature of the news. The importance is shown by the fact that the bump went for four or five days, not just one. If Anthony had shown a longer time frame, back to 2004, he could have shown that the spike in the news about climate, generated by the National Climate Assessment, was almost as big as that generated by the climate talks in Copenhagen in December 2009. Which is a very big deal! It is the most expensive non-issue in the history of mankind. This has been the largest robbery of world taxpayers ever pulled off. Once you take out the sceptics from the above graph it falls even lower. 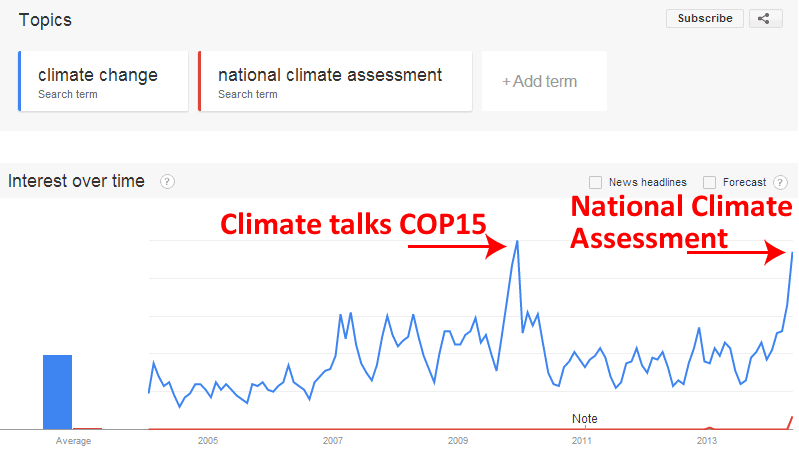 National Climate Assessment headlines will soon be a thing of the past. Children won’t know what a National Climate Assessment headline is. To be fair, announcements by denialist organisations can (amusingly) have very different lifetimes in the media. I'm thinking of Heartland's claims about the Chinese Academy of Science becoming sceptics: that was a wonderful story that seemed to offer new occasion for laughter as the days went by.